To every true crappie angler, there is nothing quite as satisfying as heading out to fish and coming back with a full stringer, having caught their limit. To achieve this, you need to know the right set of crappie fishing techniques so you can succeed every time you head out. In this article, you will find a collection of the best crappie techniques that will almost guarantee you always head back home with a nice catch every time you go fishing. Try them out and find out what works best for you. I am sure that you will find a few new tools that you can add to your (fishing) toolbox! The most common crappie fishing technique is jigging. Many anglers prefer it because it allows a level of flexibility that casting does not, and it works very well when fishing in an area with heavy cover where proper presentation is important. The way jigging works is quite simple. You drop the jig to the depth you want, then you leave the jig there for a bit. Every so often, you tip the rod slightly in order to get the attention of the crappie. After a couple of minutes, you start reeling it in slowly. It is important to do it slowly to make sure that the fish notice the jig. Stop reeling after a few turns and start the process again. Another great technique is moving the tip of the rod up as you reel, then pause and lower the rod to let the jig sink a little. Keep doing this until you retrieve the jig. You want your jig to have a fluid, lifelike swimming motion. This will trick the crappie, fooling them into thinking the jig is prey. Long rods work great with this method. When using a long rod, pull the jig up and let it fall back down slowly instead of reeling it in. Experiment a little with different speeds and depths till you find something that works for you. With your long rod, consider making a mixture of wide and shallow sweeps (between 12” to 36”) until you get a position that works. Another variation is stump bumping. The way stump bumping works is quite straightforward. If you are fishing in an area with lots of submerged stumps and brush, set up your rig with two jigs or minnows and a sinker at the bottom. Drop the rig to the bottom. Slowly start reeling it up as you jig and bump the submerged stump as much as you can. What I like to do is cast the rig about 6 to 10 feet in front of me and let it drop to the bottom. Once it is there, i slowly reel in, making sure the sinker stays on the bottom while slowly coming towards me. Basically the rig is dragging at the bottom, hitting stumps and brush. This will get the crappie’s attention and attract them to the bait. You will probably get snagged a lot and lose some terminal tackle this way. It takes some practice and patience, but once you have it down, you will see that it is all worth it. This is a simple and laid-back method and an American classic. Bobbers are great because they let you fish at the depth you want, to a high degree of accuracy each time. When you have a bobber, it is also easier to tell when a fish bites. Bobbers work great with tiny jigs because they allow you to cast further than you normally would. What I mean is that light tackle, like a 1/32oz jig head and small jig, are very light and can be hard to cast out with any accuracy (or distance). Adding a fixed bobber ads weight to the whole setup and allows you to cast it out further and more accurately. Bobbers come in different types, shapes and sizes. There are two main types: slip bobbers and stationary, or fixed bobbers. Slip bobbers are great for deep water fishing, while stationary bobbers work well with shallow waters. The shapes of bobbers are also different. Rounder bobbers make more noise when they hit the water, while thinner or pencil shaped bobbers hit the water silently. This is great if you do not want to spook the fish around a particular area. Having said all that, I used regular balsa wood bobbers and have never had an issue. You can also get transparent bobbers, which stand out because they allow you to add water in them thereby adding their weight. This is quite useful when you are fishing in windy weather or if you are using a smaller, lighter jig. Drag lining works really well when you are fishing in very deep water. To set it up, you place a one-ounce sinker at the end of your line, then add one or two leaders 18 inches apart from each other. By setting up like this, the main idea is to drag your sinker along the bottom of the lake and create vibrations that will get the crappie flocking around the potential meal. Once they come to you, they will be attracted to your bait. If it sounds a lot like stump bumping, it is because it is. The difference is that stump bumping is done in areas that are known to have heavy brush and stumps. Draglining is done in areas where the lake beds are relatively free of obstructions. When drag lining, you need to pay attention to your line at all times. If you feel some resistance at the bottom, pull up the line immediately to avoid getting snagged. Try to use thinner Aberdeen hooks that will easily let you pull them up and bend them underwater, setting your line free. Before attempting this technique, be sure to check with your local authority and confirm whether it is legal in your state. Fishing with more than one rod is a great idea if you are looking to catch more crappie. The best way to use multiple rods is to cover as many combinations and techniques simultaneously to see which one works. That was confusing but let me explain. Finding the right depth is extremely important when crappie fishing. When using multiple poles, finding the right depth can be expedited. You can set one to be at the bottom of the lake, while the other pole is 2 feet up from the bottom. After 5 or so minutes with no bites, you can reel the first pole to be 4 feet off the bottom and the second one to be 6 ft off the bottom. In 5 minutes you have covered 6 ft of depth. Once you locate the depth that the crappie are holding at, make sure that both your poles are set at that depth. Remember, if you catch one crappie at a certain depth, there are sure to be more of them around because they are a schooling fish. This technique is a favorite for boat owners. I do not own a boat myself but I have been on plenty boats where this technique was used. Fishing with these many rods may not be allowed in some states. Please check your local guidelines to make sure it is legal in your area. That being said, this is one of the most effective crappie fishing techniques. To spider troll, you need to set up multiple poles fanning out from one end of the boat. Most people use 6 to 8 poles at the same time. When spider trolling, it is much easier to find schools of crappie very conveniently and efficiently. It is up to you to decide what you want to do with each one of those poles. You can spice things up by going with jigs, minnows and spinners across the different poles, having something different for each pole. Or you can choose to ignore all of that altogether and stick with a technique that you have tried and proved to work. The choice is yours. The only downside with spider fishing is the fact that you have to keep a watchful eye on every single pole at the same time. You do not want your lines to cross, and you do not want to miss a nibble. There are also special equipment that you will need to buy if you want to mount the rods in the best way. A pro tip to spider fishing is to start with two rods and add more periodically as you get used to your initial number. This is a very common and simple technique. It works well when the goal is to cover as much open water as possible. All you need to do is cast the line as far out as possible, then reel it back in. You can make it your own by playing around with reeling steadily and reeling slowly with pauses until you find something that works for you. One trick I found to be useful is to cast out a few feet and let the rig/minnow drop to the bottom. As I reel in, I twitch the tip of the rod every 5 to 10 seconds. I have had some success using this technique on days when vertical jigging was not working so good. When using this technique with minnows, I have accidentally caught a few nice sized bass too. These happy accidents are a lot of fun, especially when the bass are 4 to 5 pounds!!!! This technique may not be legal in some states, so you have to do your research first before attempting it. Since crappie love minnows, crushed minnows are the obvious best option for chumming. Dry dog food, cat food and bread crumbs have also been known to work but they attract other species of fish as well as crappie. Some of the old school fishermen that I hang out with, swear that crappie hate being around other species of fish. They don’t like chumming because they feel that the crappie will leave if other fish are attracted. I do not know whether this is true or not. -You do not need a boat to fish effectively for crappie. If you enjoy crappie fishing, you can fish from the banks, on barges and docks. The opportunities are endless. You just need to find the spots. You also need to learn crappie habits. This way, you will be able to predict where the fish will be. Carefully choosing where to fish, depending on weather and season is very important. -Live minnows are hands down the best type of bait for crappie fishing. Crappie love minnows and they will almost always choose them over everything else. Here is an extensive article I wrote about crappie fishing minnows. -When fishing at night, be sure to bring a crappie light with you. When you have a good quality crappie light, you will attract water bugs and other underwater creatures to you. This, in turn, attracts smaller fish, and eventually the crappie themselves as they come to feed on the fish and bugs. This way, you do not have to spend countless hours chasing after crappie. When using this technique, have some patience. It takes a couple hours for the ecosystem to build around the light. -Make sure your presentation matches the season you are fishing in. Use aggressive presentation in Spring and during the fall turnover. The fish are hungry and aggressive, and they will respond better to aggressive techniques. In winter, summer and late fall, employ less aggressive presentation techniques. The fish are conserving their energy during these seasons, and they respond better to less aggressive techniques. Here is another good article I wrote on seasonal crappie fishing! -Fish at dusk and dawn if you can. I have found that crappie are most active very early in the morning and for a few more hours at dusk. Talk to other anglers in your area and figure out the times of day when you can expect the most success. -Finding the right depth to fish at is simple if you understand crappie. If you catch one at a specific depth, you will likely catch more at the same depth. This is because they are a schooling fish. You should also keep in mind the fact that they feed up, so you have to present the bait slightly above them to be within their line of sight. Here is a cool Infographic that summarizes this article pretty well! 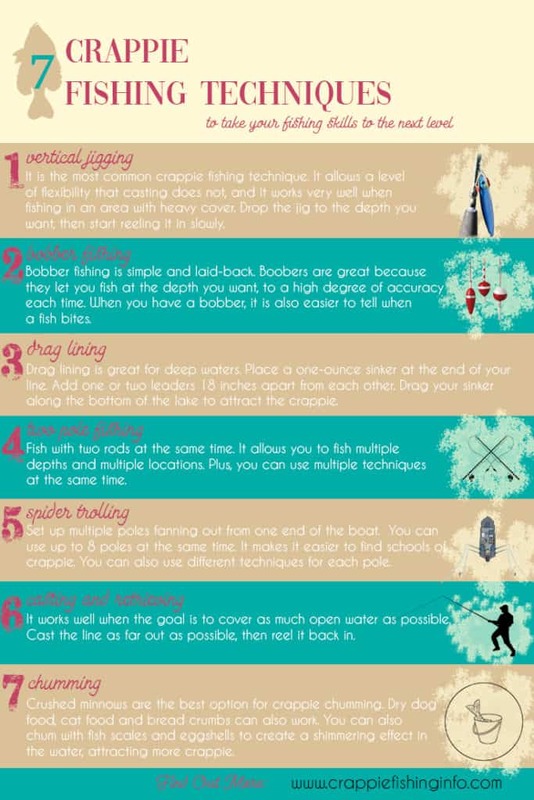 There are many crappie fishing techniques that have not been listed here. Fishing is a creative sport, and anglers usually invent signature styles and use them, sometimes to a very high degree of success. Experiment with your setups, learn on the job, and make sure you have a lot of fun while at it! Happy fishing! Leave me some comments below! I love to hear from you. Fishing Crappie Tips – 5 Awesome Tips For Catching More Crappie! Crappie Fishing Basics – Go From Novice to Pro!